Renvyle played at Intermediate level for the next four years but I was out of the country for most of that time. In 1979, I headed for the bright lights of London, stayed with Patrick Anthony Conneely at Woodford and won a London Junior Championship title with Fr Murphys. My heart was set on America however, and the following spring I flew out to the Big Apple where I was to spend three great years. During this period I played with the Connemara Gaels at both junior and senior level. It was an unbelievable sporting and social experience, meeting fellow immigrants from all over Ireland and making friends and connections for life. I didn’t win any New York championships but my love and passion for Gaelic football intensified and I had huge enthusiasm for the sport on my eventual return to Renvyle in 1983. The local club had coped very well with the demands of Division 2 football in my absence, reaching League Finals in 1979, 1980 and 1981. Renvyle went agonisingly close to reaching the Division 2 County Championship Final in 1981, losing out to Naomh Feichín, Clifden, in the semi final by a solitary point. It was the most important local derby of them all and I will always regret the fact that I played no part in the drama that unfolded that day. Five years later, the two clubs clashed again in the West Board Junior A Championship Final. This time I did play my part but the outcome was the same, a one point victory for Naomh Feichín and promotion back to the ranks of Intermediate. Our great rivals from Omey-Ballindoon lost that 1981 Division 2 County Championship Final to Williamstown by the narrowest of margins and Renvyle were left to reflect on a glorious opportunity that wasn’t grasped. It was the closest that our club ever went to achieving Senior status. Lydon, Joachim Lydon and Thady Salmon. When I returned home permanently in 1983 the County Board had abolished the divisional system and replaced it with a four tier structure comprising Senior, Intermediate, Junior A and Junior B. Although Renvyle were relegated from Intermediate to Junior A that year, the general mood and atmosphere within the club was very positive and upbeat. We also had a B team at adult level and this had a very beneficial impact on training with 15-a-side practice matches a regular occurrence. We always played on until darkness fell and it was a rarity for any player to leave the field of play before the end. Afterwards, we’d linger on at the Marian Hall for ages, chatting away about this and that, but mainly about the next football match on the fixture list. The conversation was always easy, relaxed and friendly and everybody seemed to have oceans of time to spare. It’s so different nowadays and although my generation of footballers really lament the passing of that era, we are eternally grateful that we got to experience it. In 1984, Renvyle reached the Galway Centenary Junior Cup Final and it was a match that I desperately wanted to win because the opposition was provided by Tuam Stars, the home club of my Alma Mater. It took a replay to decide the issue and unfortunately for us, it was the North Galway who got to keep the coveted piece of silverware forever. 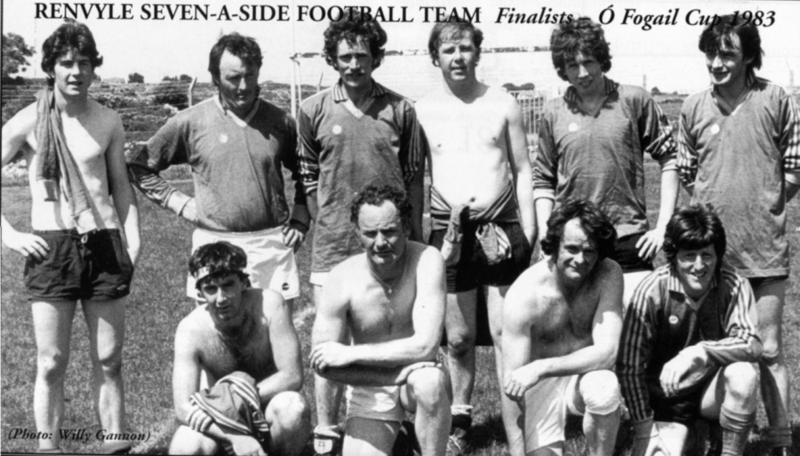 Between 1985 and 1991 Renvyle were destined to lose five West Board Junior A Championship Finals and it was very hard to come to terms with the heartbreaking nature of all these defeats. Perhaps we lacked a little bit of leadership and self belief on the big day and maybe, at times, we were guilty of too much individualism in our attacking play. Victory in any one of the above matches would have secured us a swift return to Intermediate football, where we would certainly have held our own for many years. On the plus side, Renvyle did compensate to some degree by capturing two West Board Junior A League titles in 1984 and 1988 as well as two Connemara Comórtas Peil na Gaeltachta Junior titles in 1988 and 1989, and these were very joyous occasions for all concerned. Remembered by Gerry Salmon and written by Paul Gannon. Gerry Salmon is a native of the townland of Tullybeg, on the Renvyle Peninsula, in the Parish of Letterfrack-Ballinakill.